A horse "bed sore" is an abraded area that develops on body surfaces that contact the ground when a horse is lying down and/or rolling. 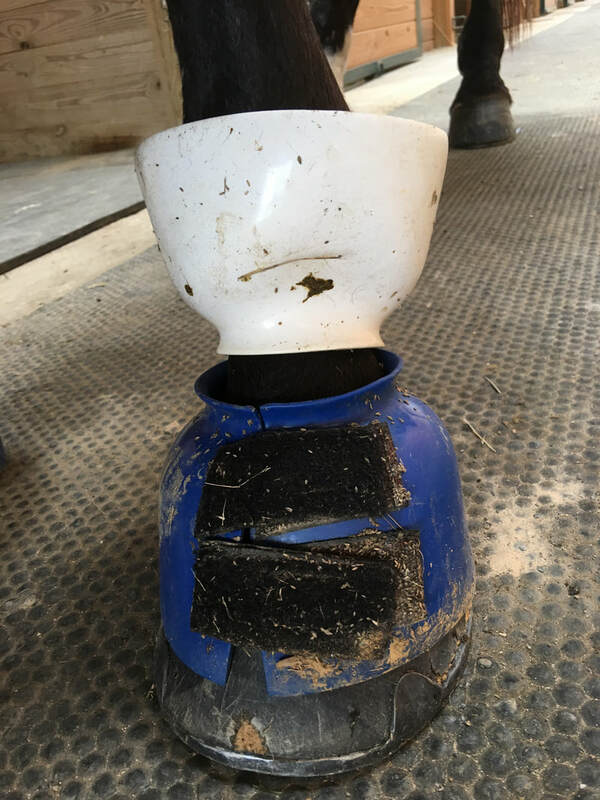 They can be located on a number of prominent areas, particularly the point of the hocks, the point of the hip, and the front of the front fetlocks. My mare Zendola Fortuna (Zen) came with fetlock bed sores when I purchased her. The previous owner put on polos when she was ridden, but no protection when she was in her stall or in the pasture. This did not seem to address the problem. I therefore set about looking for solutions. I tried a variety of commercial products, including the products in the photos, which were purchased from Valley Vet. Since Zen usually lives outside, these fabric-based products quickly got very wet and very dirty, further complicating her problem. Internet searches lead to the idea of upside down bell boots. Unfortunately, I do not recall the reference. I prefer Davis bell boots as they are easy to clean. 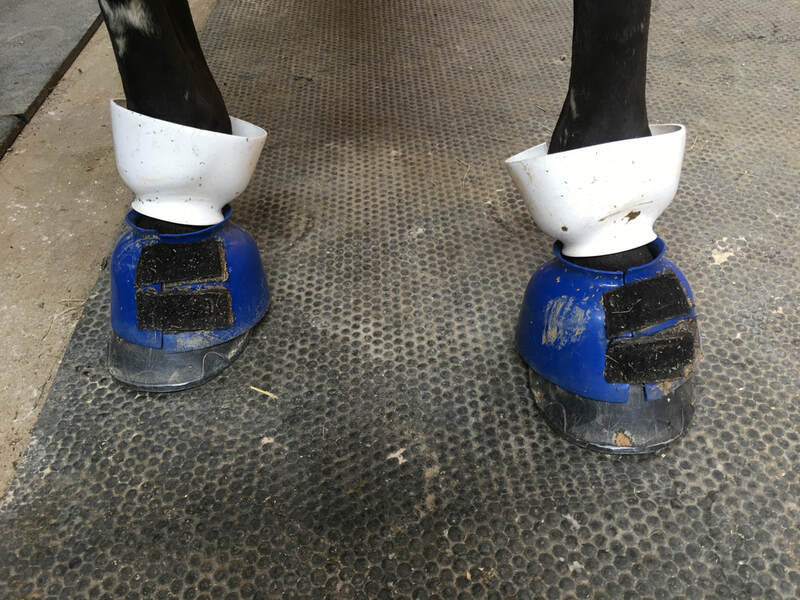 Since Zen also needs front regular bell boots, I get size large in blue for the hoof and medium in white to protect the fetlock. They are $18 to $20 for a pair. Zen can wear these outside without getting them soaking wet. The bell boots do accumulate mud, which needs to be removed frequently, which is easy to do with the Davis boots. NOTE: For the Davis bell boots, I cut off the flap of the "double Velcro" as I find the boots still stay on and the Velcro lasts longer. After wearing the upside-down bell boots for about two weeks, good preliminary healing of the bed sore can be seen. 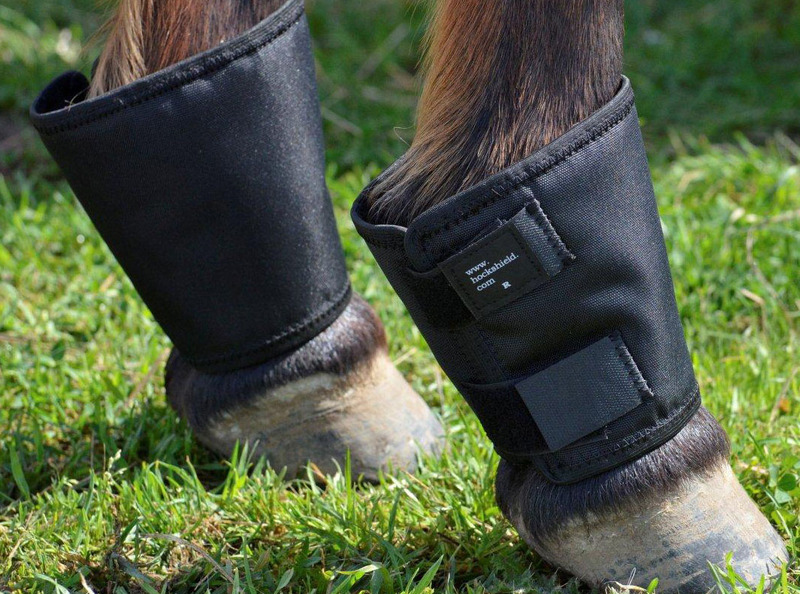 Zen wears the upside down bell boots all the time except for riding - in her pasture and in her stall. 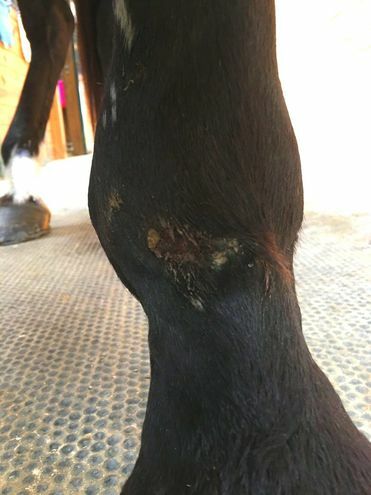 The bed sores are healed, although thickened areas of the skin are apparent and she is sensitive when the area is palpated. Zen has not experienced any rubs from the bell boots. If I leave the bell boots off for a few days, the bed sores start to develop again.